Noise pollution is increasingly being recognized as a major health problem in India. An increased incidence of noise-induced hearing loss (NIHL) has been observed in recent years. Several advances have taken place in the understanding of the molecular basis of NIHL. This can help in evolving preventive and treatment strategies. Research in genetics is progressing at a rapid pace, and several genes linked to NIHL have been identified. In the future, gene therapy may be available as a management modality. This paper will focus on the current research and future trends on the auditory effects of noise pollution. 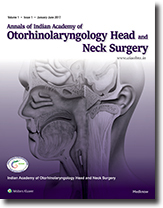 Background: Adenotonsillar surgeries are the most common otolaryngology procedures in the pediatric age group worldwide. Aims: The aim is to evaluate the prevalence, indications, complications, and postoperative symptoms resolution after adenotonsillectomy in pediatric patients in our center. Settings and Design: A retrospective study was conducted in a tertiary health facility in Kaduna, Nigeria. Methodology: The medical records of all children that had surgical procedures from January 2009 to December 2012 were extracted. A total of 232 pediatric patients had adenotonsillectomy of a total of 312 who underwent surgical procedures over 4 years. Forty-eight patients did not meet criteria for inclusion in this study. Therefore, 184 patients satisfied the inclusion criteria for this study. Data were analyzed descriptively with Statistical Package for Social Sciences version 16. Results: The mean age at the time of surgery was 3.5 ± 2.43 years. There were 102 males and 82 females in a ratio of 1:0.8. The main indications were obstructive, pharyngeal, and otologic symptoms. 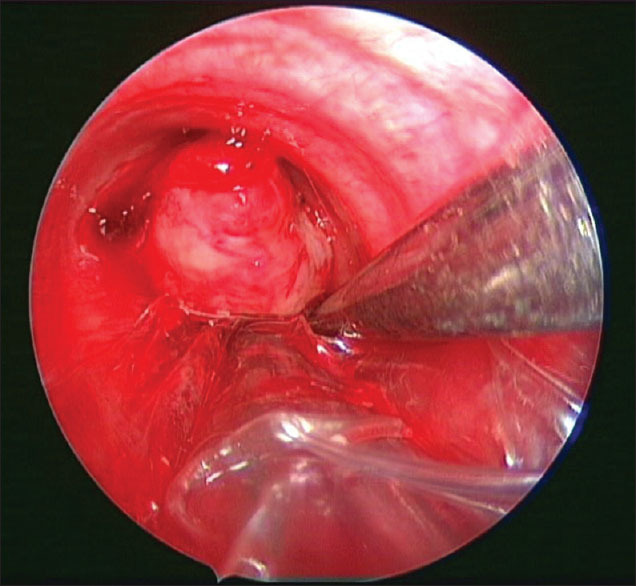 The duration of follow-up after adenotonsillectomy range from 4 weeks to 6 months, 177 (96.19%) had complete resolution of symptoms after surgery, 7 (3.80%) had an additional treatment for rhinosinusitis. Four patients had immediate mild postoperative bleeding (reactionary hemorrhage). No deaths were recorded within the period under review. Conclusions: Adenotonsillar surgeries are common otolaryngology procedures in our hospital, mainly done on account of obstructive symptoms. They are rewarding procedures in terms of symptoms resolution and safety. Objectives: Potential health risks are posed by long-term electromagnetic exposure due to mobiles. This study was undertaken to assess changes in the hearing at the level of the inner ear and central auditory pathway due to chronic exposure to the electromagnetic waves from mobile phones using both global system for mobile communication (GSM) and code division multiple access (CDMA) types of mobile technology. Study Design: Cross-sectional study. Materials and Methods: A total of 321 individuals who were long-term mobile users (more than 1 year, 238 GSM and 83 CDMA) and 46 individuals who had never used mobile phones underwent investigations including pure tone audiometry (500 Hz to 16 KHz), distortion product otoacoustic emissions (DPOAEs), auditory brain responses, and middle latency responses (MLR). The changes in the parameters were studied in mobile and nonmobile using ears of both GSM and CDMA individuals and corresponding ears of the controls to ascertain the effects of electromagnetic exposure. Results: GSM and CDMA users had a higher risk of having DPOAE absent as compared to controls (P = 0.000) more so if used longer during the day. They were found to have higher speech frequency thresholds and lower MLR wave Na amplitudes. More than 3 years of use emerged as a risk factor (P < 0.05). The damage was bilateral. Individuals using CDMA phones had more high-frequency loss than GSM user. The amplitudes of waves in MLR were lower in mobile phone users than nonusers. Conclusions: Long-term GSM and CDMA mobile phone use is associated with damage to the cochlea and auditory cortex. A 58-year-old man presented with respiratory difficulty. He had a mass in the trachea arising from the left lateral wall and was totally obstructing the opening of the left main bronchus. This posed an anesthethic as well as a surgical challenge. The patient was managed, and the mass on Hewlett Packard Enterprise proved to be well-differentiated squamous cell carcinoma. He is doing well after 6 months following radiotherapy.